Demanding Accountability In Memory of Andrew Wordes. Audio from the interview with the former mortgage holder detailing her relationship with Andrew before he passed. -It comes out that Andrews former mortgage holder never received a dime from the man who purchased the note to Andrew’s property. The note was placed in a shell company and the former mortgage holder has little documentation to show for the transaction. -A rebuttal to local false allegations of what took place the day Andrew passed, including the statement where Roswell Police Chief states he suggested surveillance of Andrew’s home. -Written on the day of Andrew’s death, with a heavy heart, his finals days are recounted along with a fierce finger pointing in the direction of those responsible. -Andrew’s eviction date is set and options are exhausted. We continue to fight and draw attention to his case. -Andrew is released from jail and fighting harder than ever for his property, his animals and his life. -The Roswell City Council plans a water plant to the tune of millions of dollars all undetected by the citizens and while driving the City further into debt. -The City Council seat held by the corrupt Becky Wynn is challenged by someone who can actually do more than brew a pot of coffee. -Andrew is thrown in jail for 99 days for illegally grading his property (to protect it from floods) and failing to meet probation for related violations. During this time, his home is looted (while under the watch of the Roswell Police Department) and the foreclosure process begins. 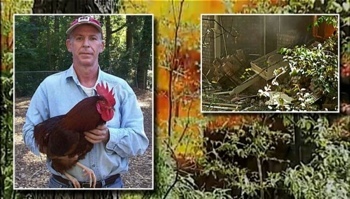 -The original post of Andrew Wordes’ trials and tribulations detailing the timeline dating back to 2009 including the poisoning of his chickens. How about an update? Even recent pictures of the property would do. Maybe another round of name and shame of the perpetrators of this offense to humanity and liberty? Where are they now? Did Arn Wall ever pay the money owed to Dora Hardeman, or is he waiting for her to die and the IOU to just go away? Does Vicki Barclay still feel good about suiciding Andrew Wordes and has the City of Roswell rewarded her with raises and promotions?